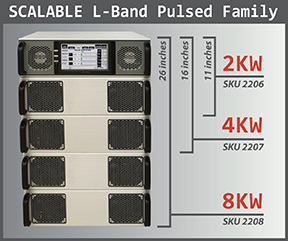 Empower RF announces the market release of the New Scalable Pulsed L Band Amplifier with an expandable system hardware architecture designed to save you money- "you buy only the power you need today" and add power amplifier blocks later when your test or application requires more output power. Adding 3U power amplifier blocks is accomplished easily and simply with no phase matching required. 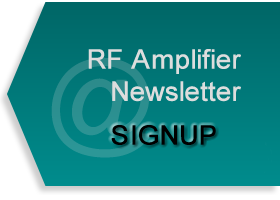 In addition to scalability, this amplifier offers an inherently rugged design and is based on our patented NEXT GENERATION architecture that virtually eliminates every internal connector found in the industries typical RF/Microwave amplifier system. Empower’s Scalable Pulsed L band amplifier gives you a lower initial cost and inexpensive upgrade path that includes AGC and ALC output operating modes that simplifies your overall system integration by eliminating the need to build your own costly external feedback loop with external dual directional couplers, power sensors, exciter control, and the software and computation power to go with it. Ideally suited for fixed gain applications, where the operator wants to have the ability to increase or decrease (adjust) the output power based on varying the RF input level without having to read output power from a costly external DDC, cables, power meter and power sensors. The SSPA gain remains constant, not output power. Empower amplifiers have the ability to operate in AGC mode since we sample both the RF input level and RF output levels in real time and because of this built in feedback loop our amplifiers have a much flatter response over the entire operating band than the typical amplifier which has an unleveled open loop response that often varies more than 3dB. Ideally suited for applications where the amplifier output power must maintain a set output level regardless of amplitude variations of the RF input signal level. 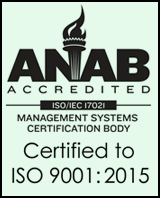 This is accomplished by accurately measuring the RF output level and comparing it to a digital reference level, in real time, the reference is set by the user either through the front panel or as a SCPI command via the LAN port. Wouldn’t you rather command the amplifier to your desired output power rather than build your own feedback loop to control the exciter RF amplitude? Certainly. Not to be overlooked, and another huge benefit of ALC mode is that it, allows you to build a system with uncalibrated components. Local and Remote Monitoring and Control user interfaces, including a Web browser, TCP/IP Ethernet, factory configurable serial RS-422 or RS232 interface and a front panel touchscreen display.